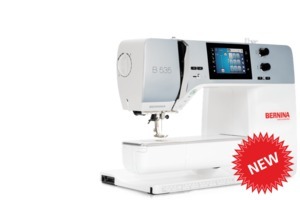 Buy a Bernina Machine, and get 50% off an embroidery module (*Qualifying models are BERNINA domestic machines that are embroidery capable) January 31st – February 4th, 2019. In Stock! The B 535, the entry-level 5 Series machine, comes with multi-function knobs, 8.5" freearm space right of the needle, a 5.5 mm stitch width and 6 mm stitch length and a 4.3" color touchscreen. Additionally, it has 11 needle positions, 4 built-in embroidery alphabets, 50 built-in embroidery designs, 300 stitch patterns, and the option to add the BSR or embroidery module.